No, actually, they can’t. Not that plants are too stupid, although, come to think of it, they are. So let’s pretend that they are smart enough, that they possess some genetic botanical impulse that allows them to tell the difference between organic chemical fertilizers and synthetic chemical fertilizers. They still can’t. There is no difference to discern. Nitrogen is nitrogen, phosphorus is phosphorus, and potassium is, well, potassium. University scientists across the globe have conducted literally thousands of studies attempting to detect any difference in plant health, genetic makeup, and, when it comes to fruits and vegetables, nutrient levels between plants fertilized with synthetic fertilizers and organic fertilizers. So far as fertilizer origin pertains to trees, shrubs, perennials and annuals, they can’t find any. When it comes to fruits and vegetables, plants fertilized with synthetic fertilizers sometimes yield a fruit or vegetable that tests slightly higher for some nutrients and minerals than its organically fertilized counterpart, lower for others, and vice-versa. A very recent study and paper by Newcastle University in the U.K. – actually, a study based on examining over 340 existing studies – announces that their researchers have found evidence of higher antioxidant levels in organically grown fruits, vegetables and grains than in those grown conventionally. I hope it’s true. The paper and research is currently undergoing scientific review, with plenty of robust disagreement. What gardeners need to know is that I, along with plenty of other gardening experts, alleged or otherwise, consider organic fertilizers superior and use them exclusively on my and my clients’ plants because they are gentler on the soil and plant root systems. Too heavy a dose of synthetic fertilizers can cause root burn, although one needs to waiver greatly from the recommended application amount. Organic fertilizers also mean you are adding organic matter to the soil, with repeated use aiding in a miniscule increase in overall organic content. 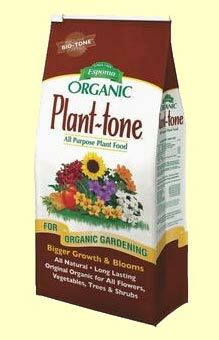 The two downsides to organic fertilizers is that they are weaker in the percentages of nutrients, not a big deal if you amend the soil with organic material (if needed) and maintain proper mulching techniques. They also take up to ten times longer to break down and allow their nutrients to become available to plants. So in cases of a valuable plant headed to the ER on the verge of death from nutrient deficiency, hit it with a synthetic, then switch to organic in the following years. But as far as plants ultimately finding and drawing nutrients from the soil, it comes down to chemistry. They don’t care in what form their hit is delivered. It’s the same hit.